File contains a photocopy of field notes and diary of surveyor J.L.P. O'Hanly, Dept. of Crown Lands, Ontario concerning a survey of Dungannon. Also contains handwritten extract of notes from 1864 and 1880 surveys of Dunnagon. 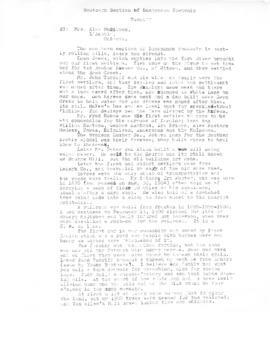 File contains a typescript photocopy of a "History of Dungannon Township" by the grade 8 pupils of L'Amable Public School, 1955. File contains a printed booklet listing voters in the municipality of the township of Dungannon. File contains affidavits signed in the 1860s for various individuals in Faraday, Madoc, Marmora, Belleville, Dungannon, Hungerford, Hershal, and Huntingdon taking office.